As I have said before 2013 has to be one of the most memorable years I will ever have. In March I got to marry my best friend, in April we honeymooned to a beautiful country and then in October we found were going to have a baby. What a year! I want to take you back to our honeymoon where a newly married Mr and Mrs Combes caught a plane to Holguin in Cuba. I am so glad that my husband and I decided on this destination as we took part in so many adventures that I never thought would be possible. We honeymooned and stayed at the hotel Playa Pesquero for 17 nights and we decided for the first week we would relax and recuperate and the second week we would take part in some excursions on the island. During the first week...BOOM...I am in the doctors office getting a shot in my bum because someone cannot have too much sun, damn you pale skin. I was advised to stay inside during the day but Tony and I did make our own fun and he taught me how to play pool. Now even though the rum cocktails were amazing I do remember that I won at least one game during our honeymoon. Also in the first week Tony and I made a big mistake in not putting sun cream on our feet, what absolute plonkers! Always, always put sun cream on your feet. The second week was the week we began the excursions on the island and the first one was called the Green and Blue Jeep Safari where we were driven around in our own 4x4 to discover the real Cuba. We also visited a fishing village and went to a local farm that had the most adorable family who opened up their home and even gave us a shot of their home-made rum. 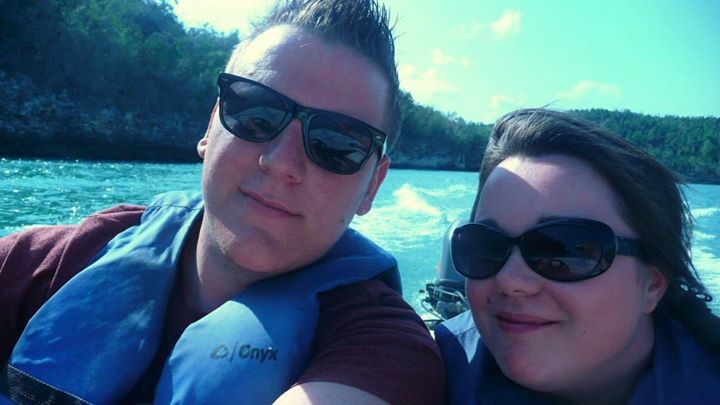 Next we got to drive our own speedboat and this was so much fun as you can imagine Tony had the best time, I wasn't allowed to drive, but I thought that was for the best as I was learning to parallel park back then. Okay I must confess I am an awful driver! The second excursion on our honeymoon was Dining with Dolphins the one we were both looking forward to and a chance of a lifetime. We enjoyed a swim with these beautiful creatures while they showed us some tricks, the truly are a magnificent animal. We even did some tricks with them, pushed across the water by water-skiing on the dolphins nose and the pulled around the pool by the dolphin. Next we watched a dolphin show where they really showed us what they could do followed by the sea-lion show. As we were a newly wed couple our tour guide stitched us up and poor Tony had to participate in the sea-lion show. I was quite glad to be honest. I love this photo and as Tony was relieved that he could change into clean dry clothes after the swim and then Cecilia the sea-lion literally laid all over him. He smelled like fish but I didn't notice so much during our lobster meal. Once we arrived on the island we could go exploring the beautiful and tranquil place. Amid the greenery Cayo Saetia has been stocked with both local and introduced wild animals such as antelopes, deer, ostriches, turtles, water buffalos, zebras and others. Alongside the wild animals, a camel and a few cattle and horses as well as a number of parrots roam freely on the island. After our lovely meal it was time to go, sailing back on the catamaran it was so calm and peaceful as the ship glided through the waters without a sound, a memory I shall cherish. Our honeymoon was amazing and I am so glad that I got to share so many new experiences with my new husband. If you ever get the chance to go to this beautiful country, please do. You will not be disappointed. 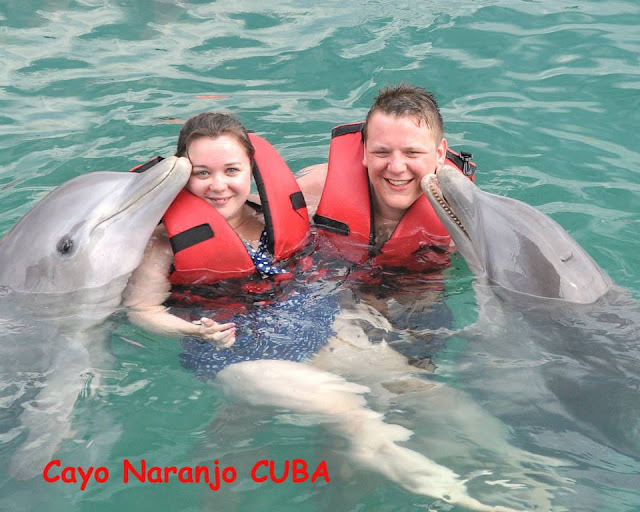 10 comments on "Our Honeymoon in Cuba"